If you have an additional screen or screens connected to your system you can set them up to show various additional items. When additional screens are detected the Enabled Primary option becomes available allowing you to configure your different screens for different activities. 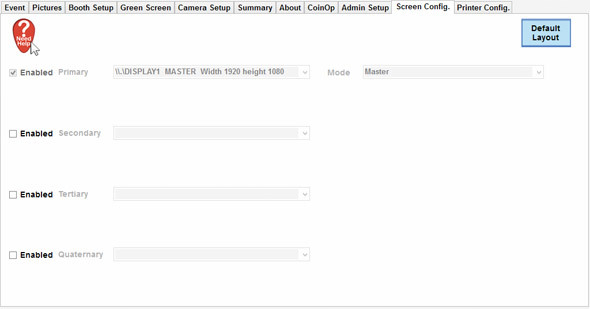 NOTE: If screens are not available they will not be selectable as in the screen shot above. If you have an external screen, or wish to hook up an external Screen you can search for screens in this Tab and select the screen from the drop down Attached Screens option. When you have found the desired screen select ‘Use Screen as External’ and Tick the Enabled option. Selecting the External Screen Mode to Advert will start the external screen showing a Slideshow of images. In your installation if you Quit out of the Software on the desktop is a folder shortcut to folders of files used by the system. In here the folder marked ‘Adverts’ contains the slideshow used. 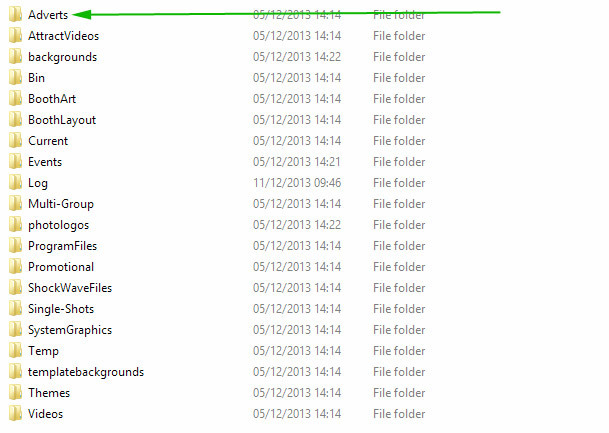 Changing deleting or adding Jpeg or PNG images into this folder will allow you to change the slideshow shown (it automatically gets the files from this folder, you don’t have to rename or call them anything specific.